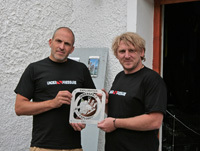 Munich, November 07, 2012 – Divers, who have successfully completed their training with InnerSpace Explorers will experience more and better service during their dives and dive trips. The dive training organization InnerSpace Explorers is consequently pursuing its philosophy to train people to become safe and self-conscious divers who may enjoy exciting dives and underwater exploration projects thanks to their skills acquired during the training. One of the essential success factors for this is the global certification of dive centers to become an “ISE Exploration Center” who can offer the relevant support to divers with an ISE certification in the planning and conducting of their dives. Over the last couple of weeks, several dive centers have applied to become an exploration center and were sucessfully qualified. Diving.de has three dive centers in Egypt in its portfolio that join the network. diving Arkassia and diving Carnella are located between El Quseir and Marsa Alam, whereas diving el Flamenco is located North of El Quseir. The philosophy of the diving.de group matches the one of InnerSpace Explorers whether it’s about quality, service or the conservation of nature and environment. The diving.de dive centers in the Red Sea are ideal for divers who have completed the ISE Bascis of Exploration course. Nitrox is available free of charge and the skills learned can be applied and strengthened in the waters with an abundance of fish. The youngest member of diving.de, diving Dragonera in the Southwest of Mallorca was recently host for an internal ISE Basics of Exploration course as well as the production of the skill and training videos for the next year. The dive center is also designated to become a partner base for the training of ISE instructors. With Rasmus Bartelt and his dive training center DeepBlueDivers in Berlin InnerSpace Explorers has also been able to add an instructor for the Basics of Exploration courses. The trained goldsmith combines in an original store concept dive center and goldsmiths. He is also responsible for the soon to be launched diver jewellery line of ISE. The Austrian dive center Under Pressure is perfectly set up to cater for the needs of technical divers with its permanent availability of helium, double cylinders and stages. Dive Center Kingfish Dive & Travel in Denmark is training two of its staff – Maria Bollund and Rasmus Dysted – to become ISE instructors and offers helium, double cylinders and stages as well as rebreathers to rent.